Swimming pool in the back yard is a great pleasure in the hot and stifling summer days during your vacation in Bulgaria. 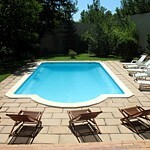 But the maintenance of the pool is important, difficult and time consuming job. The water need treating with special chemical in a certain time, the filters need cleaning, pool pump need prophylaxis. Bulgarian Home Care has a professional swimming pool maintenance team, which can handle with all your pool needs. Springtime fitting – single visit: pool walls and flooring cleaning, filling with fresh water, treating with the needed chemicals, filters cleaning and fitting, pump prophylaxis, removing the pool cover – pool ready for use. Summer cleaning – single visit: during the summer season when the pool is in use, check on the chemicals in the water and if needed - treating, filters and pump check up and cleaning. Winterization – single visit: preparing the pool for the winter months, using appropriate chemicals for the water to avoid freezing, remove the pool pump, pool beams fitting for the pool cover, pool cover placing. - Twice a month in the summer season: check on the chemicals in the water and if needed - treating, filters and pump check up and cleaning. - Winterization: preparing the pool for the winter months, using appropriate chemicals for the water to avoid freezing, remove the pool pump, pool beams fitting for the pool cover, pool cover placing. Most of the rural properties use a water pump as the water pressure in the villages is low. Bulgarian Home Care has specialists for fitting and maintaining water pumps in order the pressure to become higher.